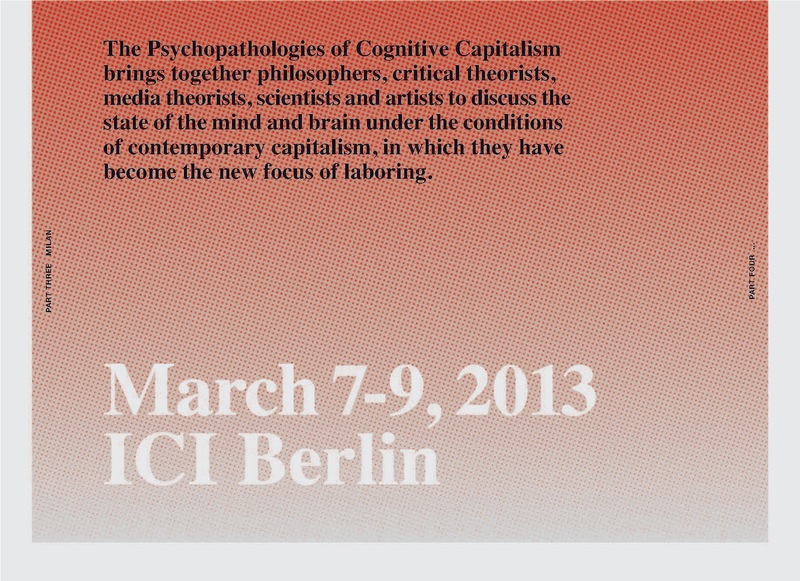 Conceptualized by Warren Neidich, hosted and supported by ICI Berlin, supported by Villa Aurora, Berlin, and The Office of Artistic Occupation, Los Angeles, The Psychopathologies of Cognitive Capitalism: Part Two will bring together an interna- tional array of philosophers, critical theorists, media theorists, art historians, architects and artists to discuss the state of the mind and brain under the conditions of contemporary capitalism, in which these cognitive apparati have become the new focus of laboring. This symposium continues to ask many of the same questions posed in Part One held in collaboration with California Institute of the Arts and Art Center College of Design last November, but elaborates upon many of the questions left unattended. 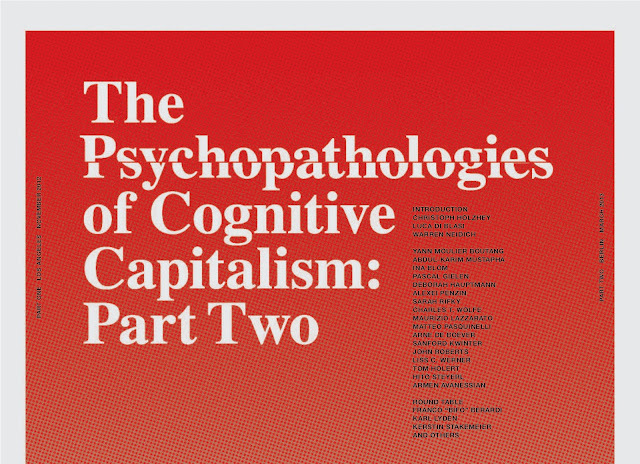 Questions such as: What is the future of mind in Cognitive Capitalism? Can a term such as Plastic Materialism describe the substantive changes in neural architectures instigated by this contingent cultural habitus? What about the Unconscious as it is known to us in dreams and other implicit psychic phenomena? Is it also modified, mutated and modulated by these evolving conditions of global attention? Is there such a thing as Cognitive Communism, and does it have distinct patterns of pathological enunciation? How has the idea of the Post-Colonial mutated as a result of these conditions? Is parametric design, which is computational and generative, an apparatus of cognitive capital? Is designed space an agent or platform in the production of subjectivity, and is parametrics complicit with its devices? Does architecture have a humane answer to its lack of empathy? How does artistic research— the methods and practices of artistic production and the knowl- edge they produce—create new emancipatory possibilities in opposition to the overwhelming instrumentalization of the general intellect in Semiocapitalism? The Only Place to Hide? ARMEN AVANESSIAN studied philosophy and political science in Vienna and Paris. He was a journalist and editor in Paris and a publisher in London. In 2007 Avanessian took up his position at the Peter Szondi Institute for Comparative Literature at the Free University Berlin. In 2011 he was a Visiting Fellow in the German Department at Columbia University and in 2012 at the German Department at Yale University. In 2012 he founded a research platform on Speculative Poetics including a series of events, translations and publications. He has published Phänomenologie ironischen Geistes: Ethik, Poetik und Politik der Moderne (Fink,2010) and Präsens: Poetik eines Tempus (with A. Hennig, Diaphanes, 2012). He has also edited several volumes including: Vita aesthetica: Szenarien ästhetischer Lebendigkeit (with W. Menninghaus and Jan Völker, Diaphanes, 2009), Aesthetics and Contemporary Art (with L. Skrebowski, Sternberg, 2011), and Realismus Jetzt! Spekulative Philosophie und Metaphysik für das 21. Jahrhundert (Merve, 2013). INA BLOM is a Professor at the Institute of Philosophy, Classics, History of Art and Ideas at the University of Oslo. Her fields of research are modernism/avant-garde studies and contemporary art, with a particular focus on media aesthetics and the relationship between art and technology. She is currently head of The Archive in Motion – an interdisciplinary research project studying changes in social memory under the impact of new media technologies. Her most recent book is On the Style Site: Art, Sociality and Media Culture (Sternberg Press, 2007). ARNE DE BOEVER teaches American studies in the School of Critical Studies at California Institute of the Arts, where he also directs the school's MA Program in Aesthetics and Politics. he has published numerous articles on literature, film, and critical theory and is editor of Parrhesia: A Journal of Critical Philosophy. De Boever's book States of exception in the Contemporary Novel was published by Continuum. PASCAL GIELEN is director of the research center Arts in Society at the Groningen University where he is Professor sociology of art. He leads also the research group and book series “Arts in Society” (Fontys School for the Arts, Tilburg). Gielen has written several books on contemporary art, cultural heritage and cultural politics. In 2009 he edited together with Paul De Bruyne the book Being an Artist in Post-Fordist Times and he published The Murmuring of the Artistic Multitude: Global Art, Memory and Post-Fordism. In 2011 De Bruyne and Gielen edited Community Art: The Politics of Trespassing and in 2012 their book Teaching Art in the Neoliberal Realm: Realism versus Cynicism came out. In February 2013 Institutional Attitudes. Institu- ting Art in a Flat World (ed. Gielen) will be released. DEBORAH HAUPTMANN is currently Acting Chair for Architecture Theory in the School of Architecture at the Delft University of Technology. Until January 2013 she directed the department “formerly known” as the DSD (Delft School of Design), which was an internationally recognized platform for research and advanced education. Her research calls on a transdisciplinary approach to design thinking, which includes disciplines such as philosophy, cultural & media studies, the social sciences and, more recently, the neurosciences as well. In 2010 she published Cognitive Architecture: From Biopolitics to Noopolitics. Architecture and Mind in the Age of Information and Communication, a coedited volume with Warren Neidich. TOM HOLERT is an art historian and critic who lives in Berlin and Vienna where he teaches and conducts research at the Academy of Fine Arts Vienna. He was editor of Texte zur Kunst and Spex, he contributed to catalogues, collective publications and journals such as Artforum, Texte zur Kunst, Camera Austria, Springerin, Afterall, etc. He co-authored books on visual culture, politics, war, mobility, glamour and the governmentality of the present, most recently, Marc Camille Chaimowicz: Celebration? Realife (Afterall / MIT, 2007) and Regieren im Bildraum (b_books / Polypen, 2008). In 2000 he founded, with Mark Terkessidis, the Institute for Studies in Visual Culture. Currently, he is working on a book on notions of artistic epistemology and on a long-term study about modernist art and culture and experimental psychology (The Diagnostic Modern). SANFORD KWINTER, Co-Director, Master in Design Studies Program. Kwinter is Professor of Architectural Theory and Criticism at the Harvard Graduate School of Design. He is a writer and editor who holds a PhD in Comparative Literature from Columbia University. He was cofounder and editor of the journal ZONE and Zone Books for 20 years. His books include: Architectu- res of Time: Towards a Theory of the Event in Modernist Culture (MIT Press, 2001), Far From Equilibrium: Essays on Technology and Design Culture (Actar, 2008) and Requiem: For the City at the End of the Millennium and the forthcoming Soft Systems on the life sciences and their impact on design. MAURIZIO LAZZARATO is an Italian sociologist and philosopher researching areas such as labour ontology, biopolitics, immaterial labour and cognitive capitalism. He is an expert on Gabriel Tarde and cofounder of Multitudes, who has been specializing in the analysis of cognitive capitalism, and its discontents, hence his work on the P2P-concept of Multitudes, the coordina- tion format in political and economic resistance, etc. His work is historically situated in the Italian movement of autonomous Marxism. YANN MOULIER BOUTANG is currently Professor of Economics at UTC. Since 2007 he teaches Humanities, Social Sciences and Digital Culture at the Superior School of Art and Design of Saint Etienne. He is the Director of the quarterly Multitudes and he is on the editorial board of journals such as Traces, Subjectivity, Cosmopolitiques, Vraiment Durable. He published Cognitive Capitalism (Politiy Press, 2012) and in 1998 he wrote his PhD on the origin of wage labour and modern Slavery. A B D U L - K A R I M M U S TA P H A is co-editor of The Philosophy of Antonio Negri, Volumes I and II. He has published in South Atlantic Quarterly and African Arts among other journals. He also serves on the editorial board of Multitudes. WARREN NEIDICH is an artist working between Los Angeles and Berlin. Artistic interventions create places for the disor- ganization and then reorganization of the understanding: “Art before Philosophy not After.” His recent awards include: The Fulbright Scho- lar Program Fellowship, Fine Arts, American University Cairo, Cairo, Egypt, 2013, The Murray and Vickie Pepper Distinguished Visiting Artist and Scholar Award, Pitzer College, 2012, The Fulbright Scholar Program Fellowship, Fine Arts Category, 2011 and the Vilém Flusser Theory Award, Berlin, 2010. He will be a resident at the Townhouse Gallery, Cairo, Egypt, 2013. MATTEO PASQUINELLI is a writer and an academic researcher. He completed his doctorate at Queen Mary University of London with a thesis on the new forms of conflict within knowledge economy and cognitive capitalism. He wrote Animal Spirits: A Bestiary of the Commons (2008) and edited Media Activism (2002) and C’Lick Me: A Netporn Studies Reader (2007). He writes and lectures frequently at the intersection of French philosophy, media theory and Italian operaismo. He is a member of the international collective Uninomade and, together with Wietske Maas, he developed the art project Urbanibalism. His current project is a book about the influence of German biophilosophy on the genealogy of biopolitcs. ALEXEI PENZIN is a researcher at the Institute of Philosophy of the Russian Academy of Sciences, Moscow, and a member of the artists and intellectuals group Chto Delat / What is to be done?. His major fields of interest are philosophical anthropology, Marxism, post-Soviet studies, and the philosophy of art. Penzin has authored numerous articles and is currently working on a book titled Rex Exsomnis: Towards a Political Economy of Sleep. S A R A H R I F K Y is a curator and writer living in Cairo. She is Co-Director of Beirut and Founding Director of CIRCA (Cairo International Resource Center for Art). Her projects include Invisible Publics (Cairo, 2010); An accord is first and foremost a proposition (New York, 2011); The Popular Show (Cairo, 2011) and The Bergen Accords (Bergen, 2011). She was a curatorial agent for dOCUMENTA 13 and author of The Going Insurrection (2012). She is an irregular contributor to art publications and periodicals including Alphabet Prime, Bidoun, Mousse, Spike Art, The Exhibitionist, Egypt Independent and others. JOHN ROBERTS is Professor of Art & Aesthetics at the University of Wolverhampton. He is the author of several books, including The Art of Interruption: Realism, Photography and the Everyday (Manchester University Press, 1998); The Philistine Controversy (with D. Beech, Verso, 2002); The Intangibilities of Form: Skill and Deskilling in Art After the Readymade (Verso, 2007), and The Necessity of Errors (Verso, 2011). He has also contributed to a wide range of journals and magazines, including: Radical Philosophy, New Left Review, Third Text, New Literary History, Oxford Art Journal, Chto Delat, Parallax, Manifesta, Philosophy in Photography, Journal of Modern Craft and Journal of Visual Art Practice. He lives in London. H I T O S T E Y E R L is a filmmaker and writer. She has consistently worked in expanding and questioning forms of documentary essay starting from time based practices but increasingly spilling over into other media. In both texts and visual work she sustains a materialism of media that highlights the material objectivity of images and their infrastructures. Over the past two decades, Steyerl has engaged with issues of political violence, media circulation and digital popular culture in relation to documentary filmmaking. The concern of her artistic practice has been described as the affective labor of the image. LISS C. WERNER is a German Architect registered in Berlin, visiting Professor Carnegie Mellon University, School of Architecture, Pittsburgh and founder of Tactile Architecture – Office for SystemArchitektur. At CMU she continued her upper level computational research studio ‘Codes in the Clouds’ published at the DigitalFutures exhibition in Shanghai 2011 and exhibited at the Venice Biennale 2012. She holds a Diploma and Master of Architecture with commendation from The Bartlett as well as a 1st class Bachelor of Arts from the University of Westminster. Further, she studied at RMIT and she received the deVere Urban Design Prize, Peter Fuld Scholarhip and George N. Pauly Fellowship. Werner is a member of Architectural Humanities Re- search Association (AHRA), the Architektenkammer in Berlin and the American Society of Cybernetics (ASC). CHARLES T. WOLFE is a Research Fellow, Depart- ment of Philosophy and Moral Sciences and Sarton Centre for History of Science, Ghent University. He works primarily on early modern philosophy and the life sciences—especially medicine, biology and natural history—focusing on themes such as the man-machine, organism, vitalism, materialism, monsters and deter- minism, and figures including La Mettrie and Diderot, extending into 20th century ‘biophilosophy’ with Kurt Goldstein and Georges Canguilhem. A former co- editor of Multitudes and Chimères, he has published in journals such as Early Science and Medicine, Perspectives on Science, Progress in Biophysics and Molecular Biology, Dix-huitième siècle and Chimères, CTheory, Flash Art and Multitudes. His edited volumes include: Monsters and Philosophy (2005); a special issue of Science in Context on Vitalism without Meta- physics? (2008); The Body as Object and Instrument of Knowledge (with O. Gal, 2010); The Concept of Organism (with P. Huneman, HPLS, special issue, 2010); Vitalism and the scientific image, 1800-2010 (with S. Normandin, Springer, forthcoming), and Brain Theory (forthcoming). His current project is a monograph on the conceptual foundations of vitalism. Pens are additionally a great path to link declare a shop opening.